Attention, places limitées! Pensez à vous enregister !! A l’occasion du mois de la BD, participez à la conférence et à l’atelier BD afin de créer une bande dessinée collaborative. Vous serez guidés par Danièle Archambault, artiste, chercheur et auteur et Anne Dumontier, professeur. 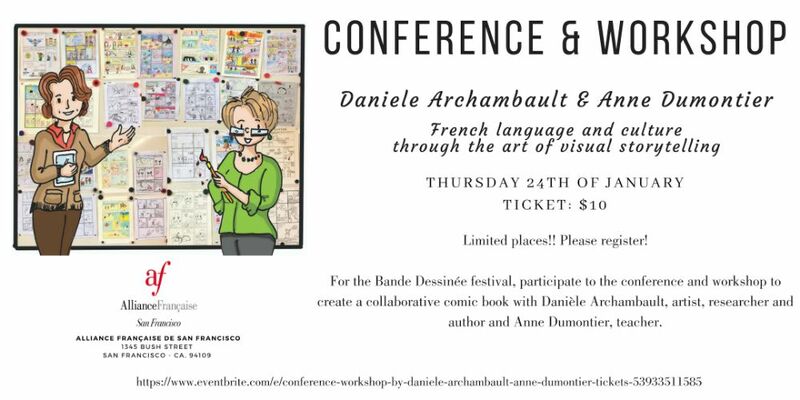 For the Bande Dessinée festival, participate to the conference and workshop to create a collaborative comic book with Danièle Archambault, artist, researcher and author and Anne Dumontier, teacher. Franco-Belgian comics, referred to as “Bandes dessinées” or “BD,” have for a long time been an important aspect of French cultural heritage. But, as culture evolves, so does the world of comics. Not only are they everywhere these days, from libraries to schools and even university classrooms, but their styles and formats have expanded, leaving many people wondering: Why is the world suddenly so fascinated by these comic books or “bande dessinées” or even “roman graphiques” and what are they exactly? This presentation will start with a brief introduction on the history of bandes dessinées and the many genres in which they developed today. Dr. Archambault will then give a presentation of her own work in visual storytelling, including bandes dessinées and graphic novels, explaining the literary and visual art techniques she favors. Ms. Anne Dumontier will then give an overview of the program the presenters have developed for the last six years, “Comics for French language and culture” in which they use comics (bandes dessinées) as an educational tool in the French language classroom. The presentation will be followed by a workshop, a hands-on activity during which the audience will experience by themselves the fun and challenges of creating a collaborative comic book and get a better understanding of the many steps involved in the creation of a bande dessinée. At the end of the evening, participants will go home with their own mini comic book and a new appreciation for the increasingly popular world of bandes dessinées and romans graphiques. Presenters will provide all materials need for the workshop. Presentation will be in French with explanations in English as needed.